In Morocco, Ramadan in the early summer is a time when locals often give their homes a thorough cleaning. 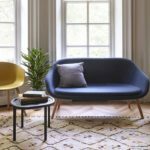 This notion of seasonal refreshment feels good for the soul and because many of you ask about how to clean your carpets, we thought we’d present some tips here on the blog. We put some questions to our favourite expert on the subject Clive Rogers, who is used to looking after valuable, often huge rugs for various city venues and country houses. “We recently cleaned a carpet from the Shard that required six people to move around wet and then re-install,” he told us. 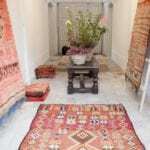 Read below for his top tips on how to clean your antique rugs at home without such assistance! Is there a technique for judging how dirty your rug is? How often should you clean a rug? What is the best way to clean the rug at home in between professional cleaning? Rugs laid out to dry in a field in rural Morocco. What’s the best way to spot clean a stain? What’s the best way to deal with animal hairs from pets? When it’s time to take your carpets for a professional clean, find Clive’s details here.